To most of workers, most of the time they are stay is not home but office. It is already one of the normal of modern people with overtime or even overnight working. Stayed in office for more than 8 hours, and sometimes it will be even longer. Work occupied most of our time. Only a few hours left to spend time with family. Life is alive, only live once. It’s hard enough to work. So why not improve your quality of life as much as possible? There are many indoor pollutants that we don’t know about in a luxurious, clean and tidy office building. These indoor pollutions are already become “healthy killers” invisible. Do you know these office killers? Or did you notice it? For the offices which we have spent a long time, maintaining indoor air quality is the top priority. Do we know where the pollutants in the office are? Decoration pollution is a part of it. The main focus is on office furniture that is centrally distributed. Most of the office furniture is made of artificial boards. Such as indoor particleboard, density board, plywood and etc., these artificial boards contain formaldehyde, toluene and other substances. Office desks, chairs, partitions, wallpaper, and laminate flooring may all emit formaldehyde. The carpet may release formaldehyde and dichlorobenzene. A group of paint brushed cabinets are the main source of volatile benzene, toluene and xylene. The leather sofa in the conference room can also release a variety of “toxic gases” such as formaldehyde, benzene, and TVOC that can contaminate the entire room. Even papers stacked in the office for a long time and the “rubber” in book, are also the source of indoor formaldehyde. Printers and copiers have an electrostatic effect in the working state, which will excite the oxygen in the air into ozone. The ozone reaches a certain concentration and has a stimulating effect on the person itself. Therefore, in a space where photocopiers and printers are used intensively, without paying attention to window ventilation, the concentration of ozone and nitrogen oxides in the room will increase, which will bring about some irritations, resulting in problems such as sore throat, eye pain, dry eyes, and even tears. . When the copying machine is working, it will produce dust that is invisible to the naked eye. The work of air-conditioning will cause the dust to be scattered throughout the office. This kind of dust will have a large amount of toner and will inhale into the lungs, causing damage to the human body and also causing rhinitis, pharyngitis and bronchitis. A large number of studies have shown that the use of detergents can release a variety of volatile organic compounds and ammonia and other irritant gases, thereby affecting indoor air quality and the health of cleaning personnel and other indoor personnel. It is one of the sources of pollution causing poor building syndrome. These invisible killers are always endangering human health, and the dangers of sub-health in the workplace are being lurking in the workplace all the time. 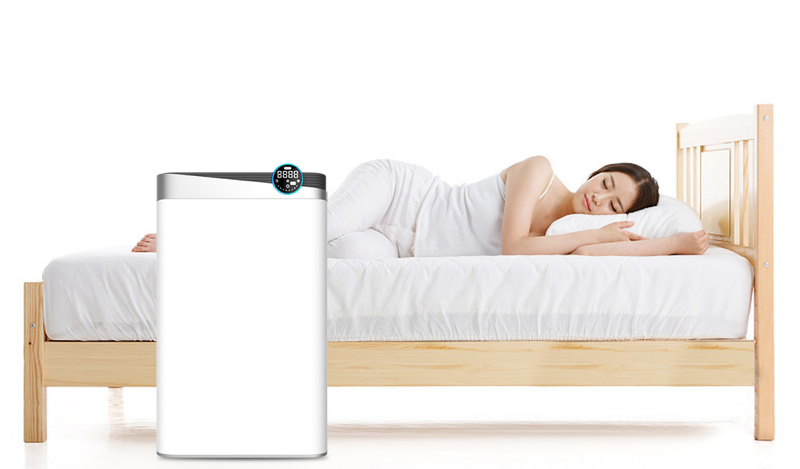 Therefore, we need OLANSI air purifier to protect us and give us a green and healthy office!